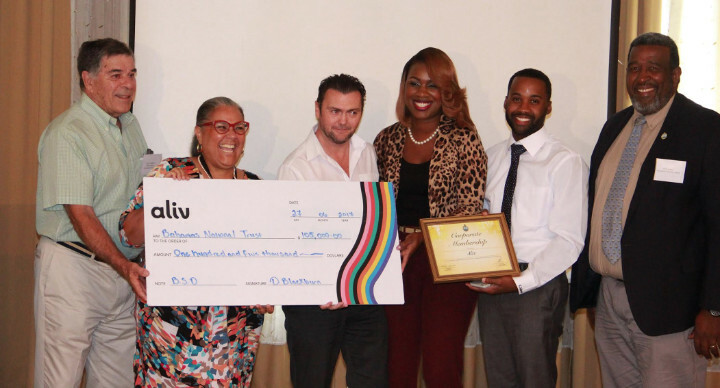 From left: Peter Andrews of the BNT Advancement Committee; BNT President Janet Johnson; Johnny Ingle, vice president of sales and marketing at Aliv; Anissa Adderley and Norman Lightbourne, marketing executives at Aliv; and BNT Executive Director Eric Carey. Aliv, the country’s second mobile phone company, has pledged $105,000 to support national parks in the Bahamas - $35,000 a year for three years. Other major companies that have pledged funds include Commonwealth Bank, Bahamas Hot Mix, and Baha Mar. At the breakfast, four major companies were acknowledged for their financial commitments to the BNT. They were Bahamas Hot Mix for $18,000, Aliv for $105,000 (over three years), Commonwealth Bank for $25,000, and Baha Mar for $50,000. The launch event was sponsored by China Construction America, which owns the landmark British Colonial property. The BNT is a non-governmental, non-profit, membership organisation working to protect Bahamian natural resources through a network of national parks and by promoting environmental stewardship. “We have a statutory mandate to manage the national park system, which includes 32 protected land and sea areas,” according to BNT Development Director Astra Armbrister-Rolle. “We are also mandated to advise the government and the private sector on environmental issues." In 2016, the BNT had a total income of just over $3.8 million. This sum was made up of a government grant, project support funds from other non-governmental organisations, investment income, proceeds from special events, and private gifts. The BNT’s Corporate Programme offers two levels of engagement - membership options for smaller businesses and partnership options for those that can make broader-scale commitments. Annual corporate membership contributions range from $350 to $2,500. Corporate partnership contributions range from $5,000 annually to $1 million and more. In return, companies benefit from brand recognition, employee engagement, volunteering sessions, media publicity, and free access to special events.